You want to buy a pipe from measurements taken in millimeters, but you are not sure to find your way around the conversion from metric to imperial? Don't panic, we explain everything so you don't make mistakes. 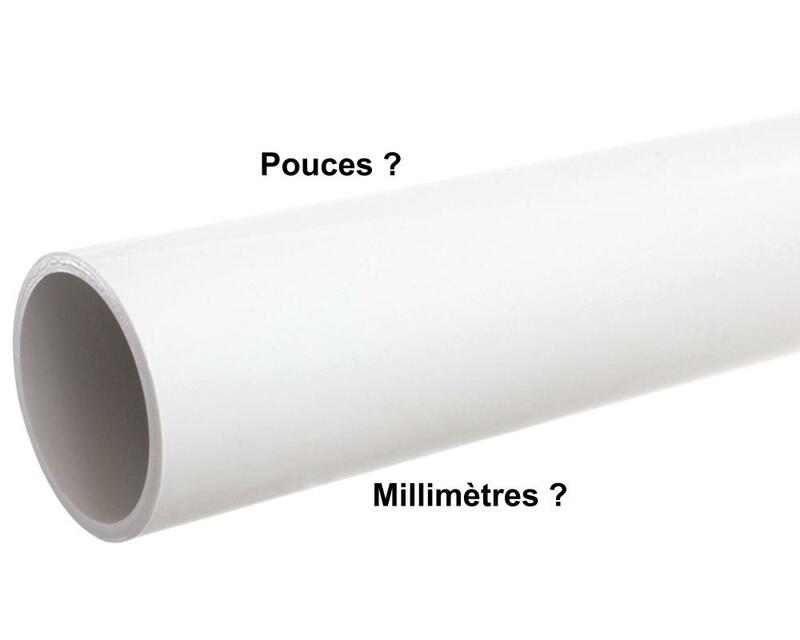 Tubs.fr supplies pipes and fittings in inches ("), the imperial system being the standard unit of measurement for the vast majority of spas manufactured worldwide. Caution therefore, measuring a pipe in millimeters and converting the data to inches can lead to confusion or poor connection choices. Imperial sizes are originally calculated on the inside diameter of the pipe (as opposed to metric sizes), but the wall thickness has changed since the establishment of standards from one component to another, from one manufacturer to another... This can give approximations and lead to poor connection choices when switching from an imperial system to a metric system. Standard US/world measurements do not correspond to standard European measurements. Here are the diameters in inches and mm of the main pipe sizes. They indicate the size of the connections to be used on the components to be connected. For example, a pipe with a European standard diameter of 33 mm will correspond to a standard diameter of 1 inch. Remember, this is the outside diameter of the male fittings, and therefore the inside diameter of the female fittings to choose in correspondence (and vice versa), of course. Example: I measure the outside diameter of a male fitting 48 mm . The conversion from metric to inch = 1.9''. By rounding, we can think that a female connection of 2'' will be necessary. This is a mistake. 1.5" (US standard size) corresponds to 48 mm (European standard size), 2" corresponds to 60 mm, so the 48 mm male connector will correspond to a 1.5" size. Unless otherwise specified, all our pipes and fittings are made of ABS and comply with the "Schedule 40" or SCH 40 measurement standard, which defines the pipe wall thickness and therefore the diameter. For a 1" male pipe (outer diameter 33 mm) for example, its inside diameter will correspond, according to SCH 40 standard, to 26 mm. This measure is important if it is not possible to use a female sleeve and you wish to connect aM+ coupler, which will fit inside the pipe. However, this standard is not universal, which means that although we know the outside diameter of a pipe (male fitting), we do not necessarily know its inside diameter. As soon as possible, Tubs.fr will provide you with the inside and outside diameters of each pipe and fitting. For pipes smaller than 1", bonding to the inside surface (with a coupler) works best because the diameter deviations are relatively small. For 1" and larger pipes, gluing on the outside of the pipe is preferred if possible. Adhesives should be used on the inside surface of 1" pipes and no longer only if there are no other alternatives (e.g. pipe cut too short).